New Year’s Evil: Kill. Kill. Kill. Kill. 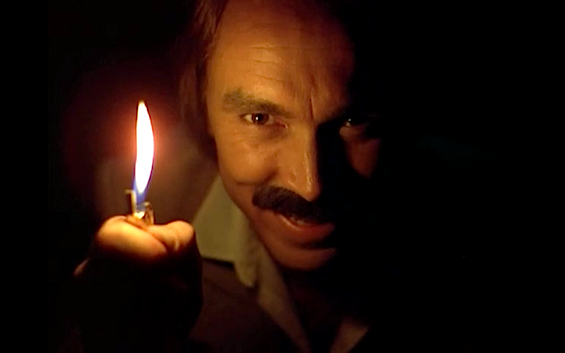 New Year’s Evil is movie about a psychopathic killer who calls himself “Evil” and murders women on New Year’s Eve. That about sums it up. It would seem that this is the first slasher movie to be put on display in The Museum of Schlock. However, this one is only on loan. I didn’t actually requisition New Year’s Evil for the museum’s collection. It is streamable from Netflix. New Year’s Evil is also available for streaming on Amazon Instant Video. Funny how much these streaming services remind me of the old Mom & Pop video stores from the 80s. Sure there’d be heavy hitters on display front like Rocky IV and Cocoon, but if you ventured into those isles, you’d find movies you’d never heard of before with the enticing box art. Renters beware, though. Sometimes you’d get suckered. 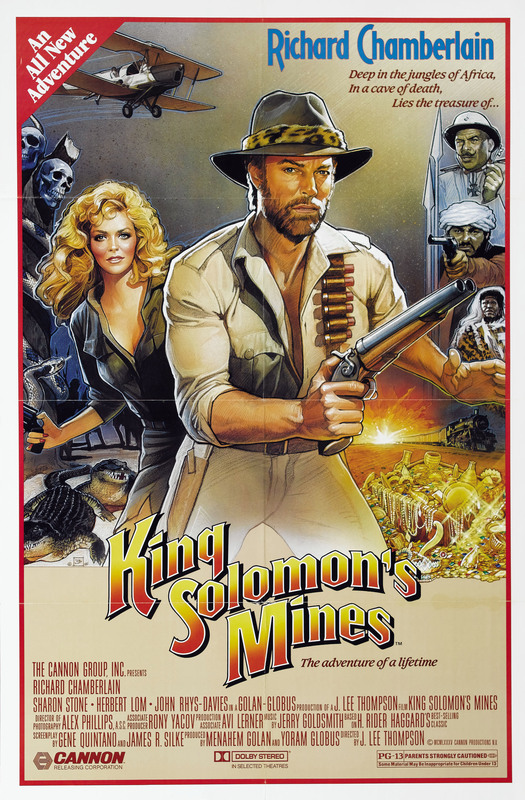 You’d be so desperate for another Indiana Jones movie that you’d pick up Golan & Globus’s King Solomon’s Mines thinking it had to be at least be half as good as Indiana Jones and the Temple of Doom before realizing it wasn’t even half as good as Cocoon. But Golan & Globus didn’t just produce cheap Indiana Jones knock-offs. 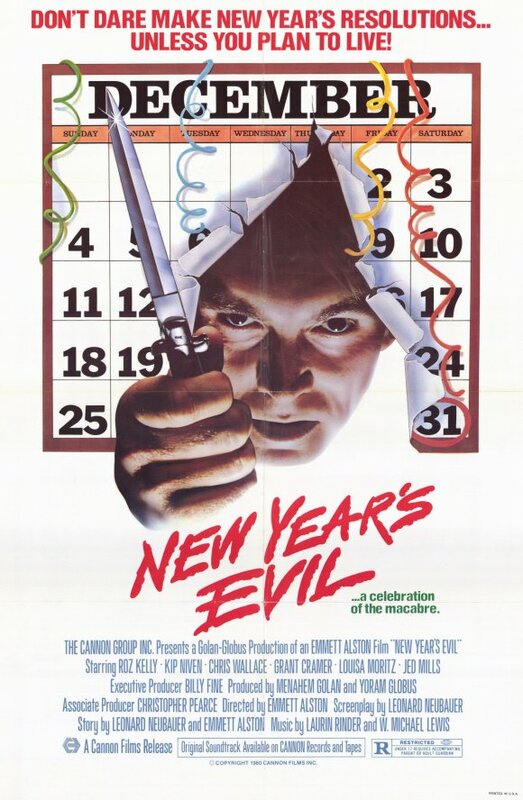 They also produced the occasional low budget horror film, and New Year’s Evil was one such horror film. 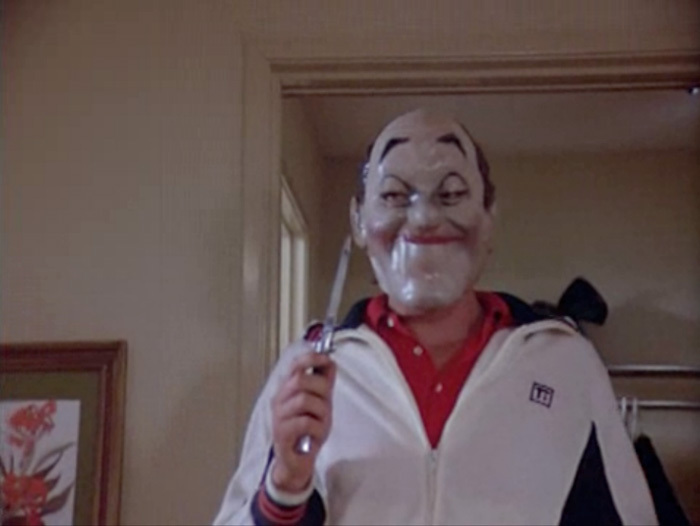 Released in 1980 and directed by Emmett Alston, New Year’s Evil is unique in that it shows the audience what the killer looks like from the very beginning. No elaborate masks or hiding his face in the shadows. This killer is right out in the open. Granted, he does disguise himself in other ways, dressing up as a priest or a doctor when it best serves the kill. In one scene, Evil has to dress up in a swinging leisure suit in order to sell himself as Erik Estrada’s financial guru manager something something. A couple of women buy it and it’s not long before they’re in his become his next victims. You see, Evil must kill when the clock strikes midnight for each of the four time zones in the United States. He screws up when on the hunt for victim number 4. Evil accidentally runs over a member of a biker gang and the rest of the gang doesn’t take to kindly to this. They chase him all around town, eventually cornering him in a drive-in. This reminds of how that other biker gang kept going after cannibals in Cannibal Apocalypse. What’s with these bikers and their harassment? Cannibals and psychopathic killers are people, too. They need to know they can walk the streets safe at night. 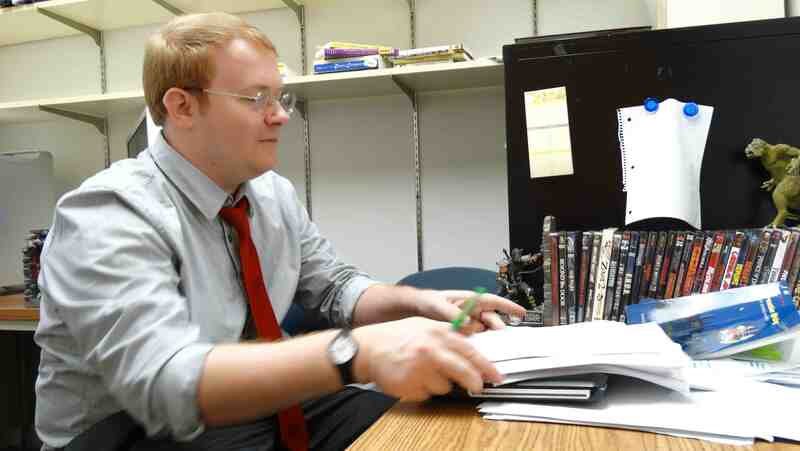 Nurses in mental institutions can be bribed with expensive champaign. Lounge ladies can be bribed with Erik Estrada. Bikers will a flip off a priest without hesitation. Covering your head with your mother’s nylon stocking is perfectly normal and don’t let anyone tell you any different. Bikers don’t mess around. They’ll chase you and chase you and prevent you reaching your third victim in time. Wearing a Stan Laurel mask only serves to infuriate the police officers that are already shooting at you. Setting up an elaborate elevator death trap for your fourth victim will seem like a cool idea until your victim manages to survive unscathed. Four victims is not too impressive for a psychopathic killer who calls himself “Evil.” Jason Voorhees had four times that number by the end of Friday the 13th Part III. Don’t be upset if you fall to your death while evading capture by those pesky police officers. Your psychopathic son lives on to carry out your legacy.